Aesop recently opened its first signature store in Munich – the company’s seventh in Germany. Tucked within historic city centre The Luitpoldblock, and created in collaboration with local firm einszu33, the design experiments with balance and tension effected by striking contrasts in materiality and texture, and through tactile, delicate accents. 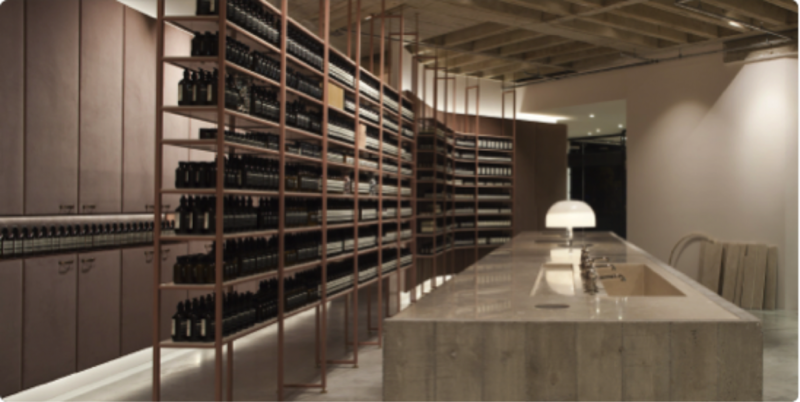 Centrally positioned in the main room, an outsized concrete point-of-sale counter complements a tiered concrete ceiling and screed floors; collectively, these Brutalist elements resonate with the architecture of the neighbourhood. A Carrara marble top and recessed marble sink contrast the counter’s monolithic austerity and soften the interior’s atmosphere. In the adjoining space a rounded concrete sink affords extended consultations, while vintage furnishings invite repose. A vertical trapeze of aged brass with slender shelves of Carrara Marble descends from the ceiling and sits in the window, which yields generous views of the urban square beyond. The interior wall opposite the window is finished with soft velvet panels, which catch light and reflect rosy hues that shift over the course of the day.